The future of solar energy is bright (pun intended). The sun provides a clean, safe, affordable and renewable energy resource at a volume that is almost incomprehensible. The amount of energy radiated on the United States in one day is enough to power the entire country for a year and a half. The best part of all this energy is the cost – it’s free. 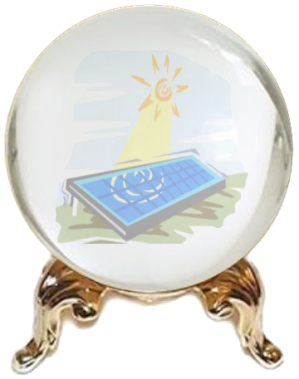 Below is a brief rundown of some of the considerations about the future of solar energy. The role solar energy will play in the battle against global warming is one of the biggest reasons solar energy is here to stay and expand in the future. Electricity is a necessity to sustain our way of life and continued economic growth not only in the United States but worldwide as well. About two-thirds of CO2 emissions from fossil fuels are associated with electricity generation, heating, and transportation. We already know how to use solar energy to generate electricity with very low CO2 emissions, and we know how to use electricity to provide heat and surface transportation services. …the solar resource is enormous, dwarfing both global energy consumption and the potential scales of other renewable energy sources. A plausible way to reduce global CO2 emissions despite growth in energy consumption would be to increase dramatically the use of solar energy to generate electricity and to rely more on electricity for heating and transportation. The history of oil price volatility “has demonstrated that investing in crude oil is an increasingly risky strategy,” it continues, while renewables could offer a safer, more appealing option. Large investor dollars guarantee the continued growth of the solar energy market. As part of the Energy Policy Act of 2005 a 30% federal tax credit was enacted to stimulate the use of renewables in energy production on both the residential and commercial levels. The Solar investment Tax Credit has proven to be a very successful and will remain so. On the Home Solar or local level increased production and huge advances in the efficiency of solar panels has made home solar energy not only affordable but cheaper than conventional utility companies. Over 600,000 homes and businesses have installed solar power. 200,000 of these installations were in 2014 alone. In 2014 solar power accounted for 32% of all new electrical power generation in the U.S.
An added benefit of home solar power is increased property value. A recent study by Berkeley Labs shows that “that home buyers are consistently willing to pay PV home premiums across various states, housing and PV markets, and home types; average premiums across the full sample equate to approximately $4/W or $15,000 for an average-sized 3.6-kW PV system.” Advances in battery technology are really pushing the solar industry forward as well. The Tesla PowerWall is leading the charge in new solar battery technology. Solar power is become a huge “win – win” proposition. Solar is not only a way to help save the environment but has proven to be a sound economic investment as well. This has caused solar power generation both on the residential and commercial levels to explode over the past few years and there is no end in sight.